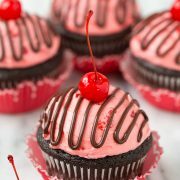 Cherry Cordial Chocolate Cupcakes are a perfectly decadent super delicious cupcake! They taste just like those cherry cordials we all love but in party friendly cupcake form! Who could resist? Perfect treat for Valentines or a birthday. Preheat oven to 350 degrees. Place the chopped chocolate and cocoa powder in a medium bowl, then pour hot water over chocolate mixture and whisk until smooth. Transfer bowl to refrigerator and chill 20 minutes, stirring once halfway through chilling, until cooled (or 10 in freezer stirring once). Meanwhile, in a mixing bowl, whisk together flour, granulated sugar, salt and baking soda. In a separate mixing bowl, whisk together canola oil, eggs, vinegar and vanilla. Pour chocolate mixture into oil mixture and stir until well combined, then add flour mixture and whisk until smooth. Divide batter evenly among 12 paper lined muffin cups (about 1/4 cup in each). Bake in preheated oven until toothpick inserted into center comes out clean, 17 - 19 minutes. Allow cupcakes to cool in baking tin several minutes then transfer to a wire rack. Cool completely. Add chocolate chips to a bowl. Heat cream to nearly a boil (either in microwave or on stove top) then pour over chocolate chips. Stir until melted and smooth. Let cool until thickened, either in refrigerator or or at room temperature (you just don't want it to be runny but still pipe-able). While ganache is cooling, in the bowl of an electric stand mixer whip butter and salt until pale and fluffy. Mix in 1 cup of the powdered sugar then stir in maraschino cherry juice, vanilla and desired amount of red food coloring if using. Mix in remaining powdered sugar and whip until pale and fluffy. Using a rubber or silicone spatula, fold in chopped maraschino cherries. Place two maraschino cherries (no stems) over tops of cupcakes. Dollop desired amount of frosting over cherries (I wouldn't recommend using a lot, this is a sweet frosting and a little goes a long way) then spread frosting around cherries. Transfer chocolate ganache to a small resealable bag, seal bag and cut a tip from one corner. Drizzle over cupcakes and top each cupcake with 1 cherry. Let cupcakes rest 1 hour (I felt this was best as it not only lets the ganache set but it seemed to lightly tone down the sweetness of the frosting as the flavors melded). Recipe source: cake portion adapted from Cooks Illustrated "The Science Of Good Cooking" pg. 431.